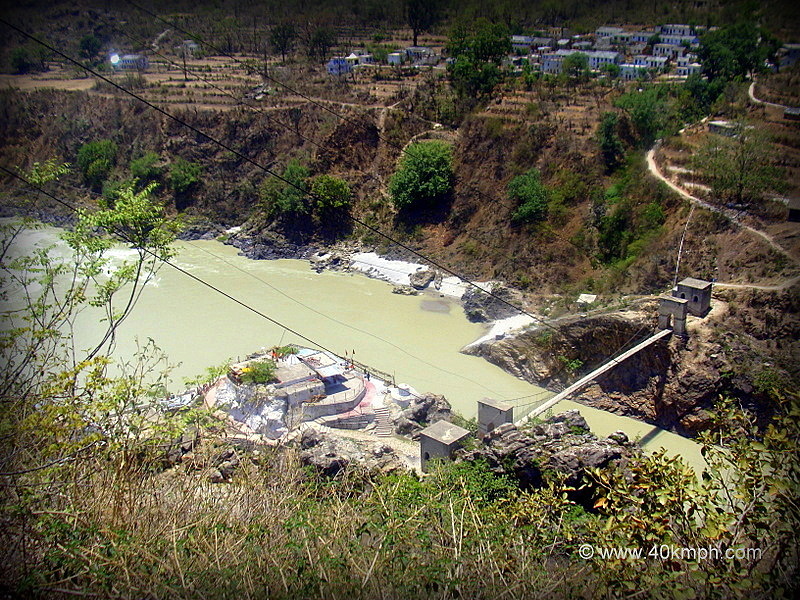 Dhari Devi temple is situated 15 km approx. from Srinagar Bus Depot via National Highway 58 at Kaliyasaur in Pauri Garhwal district of Uttarakhand. It is believed The deity – Dakshin (south facing) Kali Kalyaneshwari is swayambhu (self-manifested) and a creation of Lord Vishwakarma. The temple is popularly known as Dhari Devi. Within 52 Sidh Peeth of Uttarakhand, Dhari Devi is one of them. Dhari Devi is the most popular name because in-front of the temple across Alaknanda river is Dhari Gaon (village).Â Dhari Gaon is said to be existing from the time of Pandavas. Devi is also known as Shamshaani as shamshaan (cremation ground) is near-by. The temple is situated on top of Singh Shila (lion’s rock). If a person watch carefully from top of the close-by mountains the rock below the temple is as equal as lion’s head. The deity changes her face three times within a day. It is believed sitting alone within the temple in-front of the deity is not possible. Shiv-Parvati shila (rock), Suraj Kund (the place where Adi Shankaracharya had bath) is very close to temple. Thank you priest – said I. And once more I was walking towards the deity to offer prayers. Afternoon hours – Raudra Roop, I agree totally. Prayers. Rudraprayag to Dhari Devi: 21 km approx. please save ancient civilization and culture of Himalayas.make people aware about the value of Indian heritage and preach young generation to preserve it.